The introduction to collecting old newspapers for most typically comes through finding a newspaper of recent past with a headline remembered from history class. They turn up in flea markets, garage sales, and attics, but wherever the discovery, there is a fascination which—for many—begins a quest to find more and better. Of the five centuries from which old newspapers can be found, the 20th century has one distinct advantage and that is displayability. It was just before the turn of the 20th century that newspaper competition was rampant in the United States and bigger and bigger headlines became one method of grabbing attention over a competitor’s newspaper on the corner newsstand. Headlines from the Spanish-American War of 1898 were often large and dramatic, and that format carried well into the 20th century. Although the aim was to sell more newspapers, the unintended long-term consequence was to intrigue the collector with an enticing headline that would look great on display. I will touch on some of the more notable events of the 20th century, in chronological order, which may present a “checklist” of events which would be great additions to any collection. Their can be little question that the oil industry transformed the American landscape, and the first major discovery happened at the beginning 20th century with the Spindletop well near Houston. Just two years later the Wright brothers would make history with their first powered flight, again an event which would transform that way the entire world lives. The first major natural tragedy would be the San Francisco earthquake of 1906, and many newspapers provided graphic details. The sinking of the Titanic was the next major tragedy which dominated the headlines for not just a day but for several weeks, and newspapers did much to dramatize the event & its investigation. While some newspaper maintained a very conservative format, others sported full banner headlines in bold type with illustrations and photos to make for an appealing front page. Just 3 years later the sinking of the Lusitania would receive similar response by newspaper publishers across the country. World War I made headlines in American newspapers beginning in 1915, but it was America’s entry in the war in 1917 that would spark more detailed coverage of the war that would end in 1918. News of the armistice ending the war would result in some of the largest & most dramatic headlines to appear in newspapers up to that time. 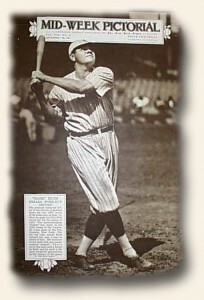 Following the war, baseball would enter its golden era when Babe Ruth came on the scene, he becoming one of the first of the major stars of the 20th century and capturing headlines in newspapers across the country. But just prior to his hay-day was the infamous “Black Sox” scandal of the Chicago White Sox, with charges of fixing the 1919 World Series games involving several Chicago players. But those headlines would soon be supplanted by the exploits of Ruth as his record-breaking streak added much excitement to the game of baseball and newspapers were only too happy to comply with considerable coverage. Other stars would find prominence as well, including fellow Yankees Lou Gehrig & Joe DiMaggio, and later on Ted Williams & Jackie Robinson among the more notable. Charles Lindbergh’s accomplishment of being the first to fly solo across the Atlantic caused him to be one of the most famous men in the world at the time, and newspaper coverage was exceptional. But shortly after his 1927 flight the gangster era came to the attention of newspaper, the St. Valentine’s Day massacre of 1929 being one of the first major events to find front page coverage across the country. This fascinating era would extend into the mid-1930’s and names such as Al Capone, John Dillinger, “Baby Face” Nelson, “Legs” Diamond and “Dutch” Schultz were commonly found on front pages. The stock market crash of 1929 would trigger the Great Depression, which affect the entire nation in so many ways. Collectors look for the most dramatic wording in such a headline, with “Crash” “Tragedy” and similar cataclysmic words making for desirable collector pieces. Other sports and sports stars would come to prominence in newspapers of the day, including golfer Bobby Jones and his Triple Crown accomplishment in 1930; Phar Lap, one of the more famous race horses of the 20th century; Jim Thorpe and his Olympic and football prowess; Jesse Owens at the 1936 Olympics, World Cup soccer, Notre Dame football, boxing greats Jack Johnson, Jack Sharkey, Max Schmeling & Joe Louis commanding headlines, and so much more. There was such extensive coverage of sports in the 20th century that many build huge collections with this singular theme. Perhaps the most defining event of the 20th century was World War II, begun with the ascendency of Adolf Hitler and the Nazi party in Germany and his invasion of Poland in 1939. With America’s entry in the war upon the attack on Pearl Harbor, barely a single newspaper for the next 4 ½ years would be devoid of war coverage. Because such issues were commonly saved and found in attics by their children, collectors pursue only the most major events and with the largest headlines. Tops of the list would be Pearl Harbor, battle of Midway, the D-Day invasion, the death of Hitler, the end of the war in Europe, the dropping of the atomic bomb, and the end of the war in the Pacific. Many tabloid-size newspapers had the entire front page consumed by headlines, lending themselves to displayability, particularly given their smaller size. The Korean War would begin the 1950’s, and would be followed by events of the Cold War. At the end of the decade music would begin making some headlines, led by Elvis Presley and more tragically with the airplane death of Buddy Holly & Richie Valens. A few years later the Beatles would come on the scene to define the music world for the 1960’s. Politics always made headlines in the 20th century which began with McKinley and ended with Bill Clinton, but perhaps the most collectible political person would be John F. Kennedy. His assassination –the second of the 20th century–stunned the world , and some headlines were extremely dramatic. 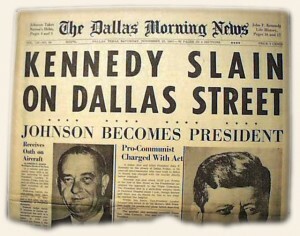 Always the “best of the best” would be newspapers from where the event happened, so it is no surprise that Dallas newspaper reports on the JFK assassination draw the most interest. Although the space era began as early as 1928 with the work of Robert Goddard, it was the success of Sputnik & the resulting space race in the late 1950’s that would captivate the headlines. America made its mark in the early 1960’s with Alan Shepard and John Glenn, culminating in 1969 with the landing of men on the moon & their safe return. Scattered throughout the 20th century are many memorable names which made the occasional headline, including Mark Twain, Thomas Edison, Houdini, Albert Einstein, Rudolph Valentino & Walt Disney to name but a few. Regardless what events or themes a collector might pursue from the 20th century the challenge is to find the most dramatic and impactful report. Large headlines command a premium, and when photos or graphics accompany a headline it only adds to the appeal. Collectors know some great headline reports are lurking out there just begging to be found. The thrill is finding them, and make them prized additions to their collection.